Whether the flag planting should have been depicted in the movie or not is a debate we will let other people rage over. We take this opportunity to refute the inference Gosling makes that “human achievements” must be stripped of their nationalities. When you read a Dostoyevsky novel you marvel at his stark observations about human existence and morality. He is widely considered a literary genius. One could say his transcendent writing – translated the world over – marks a human achievement. But no one would never think to discuss any of his works without understanding his Russian roots. Because it is his experience, as a Russian, that drove the narrative of his stories. When you drink in the beauty of a Ming dynasty bowl, you marvel at the distinct and intricate blue design, perhaps a dragon, with each scale carefully etched in caring detail. One could say the ability to create these divine porcelain vessels and plates mark a human achievement. But no one would ever think to reflect on the exquisiteness of the piece without understanding its Chinese foundation. Because these vases and dishes were developed from centuries of uniquely Chinese artistry and craftsmanship. And when you consider the raw visage of a hand-carved Masai mask, you marvel at the ferocity captured so vividly in wood and paint. These masks are considered among the finest creations in the art world. One could say the development of these visceral and evocative pieces mark a human achievement. But not one would ever think to consider the instinctive impact of this art without understanding the tribal and regional significance. Because the development of the masks is inextricably intertwined with the evolution of the Masai culture itself. And similarly, when you read about the Apollo program, you marvel at Neil Armstrong’s strength, courage and grace. He is a hero, as much as he might have been discomfited by that moniker. One could say, as Ryan Gosling has, that his historic first step on the Moon is a human achievement. But removing his American heritage and roots misses the story. Like Dostoyevsky, Ming dynasty porcelain and Masai masks, Neil Armstrong is a product of his, in this case, American experience. The Apollo missions were developed with American funding and persistence. And the Moon landing is inextricably intertwined with the evolution of American culture in the throes of a Cold War. The fact is human achievement transcends national boundaries. But the work to get there often does not. Thankfully, as we explore space and nations work together to advance our human footprint, this is slowly changing. Even so, nationalistic experience and pride remains evident. 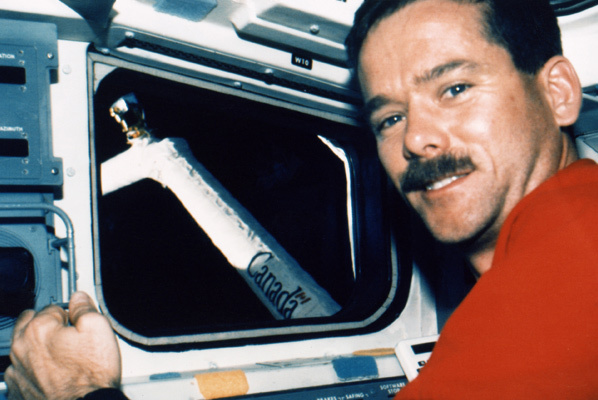 After all, in celebrating its home-grown human achievement, Gosling’s native Canada chose — proudly and rightly so — to display the Maple Leaf on the first robotic arm in space.